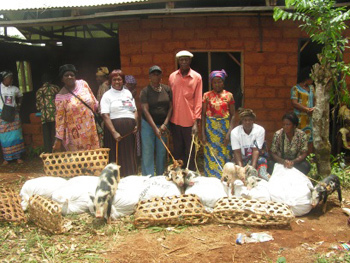 We report the work progress of THE BIOSECURITY FENCING PROJECT of MOBILELIVESTOCK Group. This Biosecurity project is ongoing to build the fence of the piggery for the Demo-Farm little by little. Which is to give farmers opportunity to learn how to make the good animal farm to protect them from animal diseases which is common in this area. We report to explain how funds are used in the realization of the fence in stages. The field report has been posted. REPORT ON THE BIO-SECURITY FENCE PROJECT OF MOBILELIVESTOCK COMMON INITIATIVE GROUP. The field report of the POG event was posted. 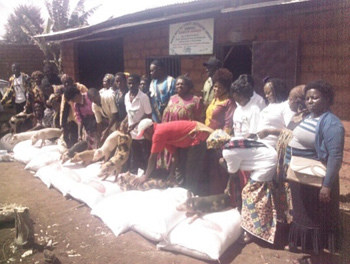 ; 2017 ACTIVITY AND FINANCIALREPORT of "A Pig Van Djouke Project"
Same as the scenario of 2016, the pigs from 2016 beneficiaries of the project "A Pig Van Djouke" were handed to beneficiaries of the 2017. This year this project is 10 years old, so the POG exercise culminated with the anniversary celebration. 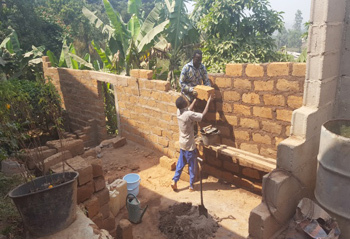 This report will render how the event was took place and the account of the 625 Euros sent by Djouke through a Dutch family friend Mr. BenZwinkels who is settled in Cameroon. 2017 ACTIVITY AND FINANCIALREPORT of "A Pig Van Djouke Project"
THE BIOSECURITY FENCING PROJECT OF MOBILELIVESTOCK GROUP was carried out partly. Mobile livestock group had as priority project for 2017 the construction of a fence round the livestock farm in order to protect the lives of most especially the pigs. Considering with history of this farm which has experienced great loss, due to seasonal disease out-breaks, Mobile livestock was left with no other option than to embark on the construction of a bio-security fence. 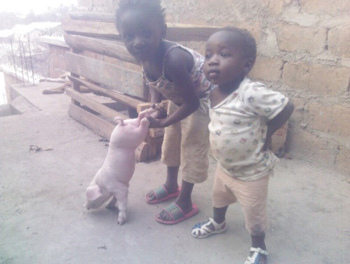 This year of the fund money of "A pig Van Djouke" project came in two installments, 400 Euros and then 200 Euros. In November 2016, 200 Euros was received, and this report tell us how that money was used. 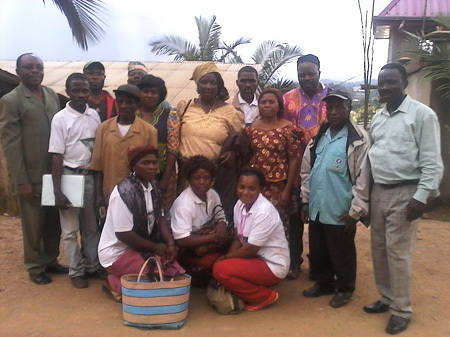 During the term from July 18th to July 25th in 2016, the evaluation visits to NOWEPIFAC project groups in the areas of Widkum, Bawock, Batibo and Bamenda was carried out. The evaluation team of the cooperative rated how current projects are going and how beneficiaries keeping their pigs or infrastructures given by various projects. The field report was posted. 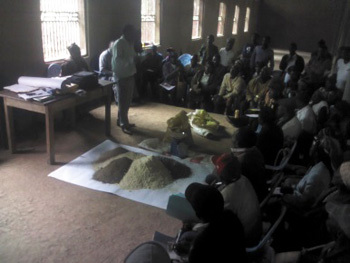 After the regular monthly meeting of NOWEPIFAC group delegates on June 8th 2016, the way to make the organic fertilizers "Bokashi", which NOWEPIFAC CEO Titus learned in Japan was shared with group delegates of the cooperative. The organic fertilizers will keep the soils of our farm healthy and it will also give good influences for human's health condition. ONE DAY - Training on the making of organic fertilizers "BOKASHI"
A Letter of appreciation for Japanese supporters was sent from farmers/members of our cooperative. 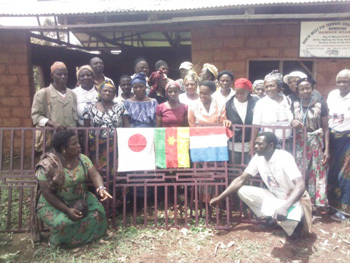 During the regular monthly routine meeting of NOWEPIFAC group delegates that took place at the NOWEPIFAC head office in Bamenda on 8th June 2016, the 10 delegates at present took turns to express how they and their group members feel toward the hand of fellowship extended to the cooperative by our Japanese supporters. The contents of the letter was posted. "APPRECIATION LETTER FROM MEMBERS OF NOWEPIFAC THROUGH THEIR GROUP DELEGATES"
The field report of the POG event was posted. 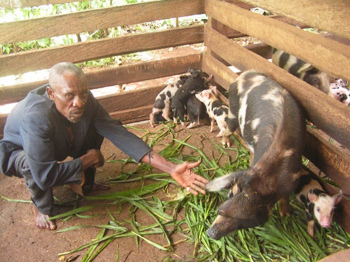 ; 2016 ACTIVITY AND FINANCIALREPORT of "A Pig Van Djouke Project"
With the aspiration of moving further "A pig Van Djouke" Project has extended its activities to Batibo sub-division this 2016 and have chosen the village of Guzang, to launch its activities on the 16th birth day of Djouke the project donor. This report will render account of how 400 Euros sent by Djouke has been effectively used in Cameroon to realize her dream. 2016 ACTIVITY AND FINANCIALREPORT of "A Pig Van Djouke Project"
The final field report in 2015 was posted. 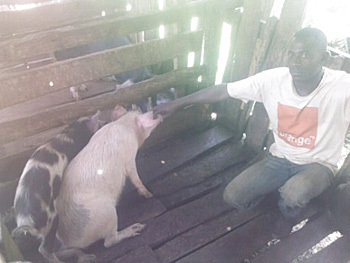 ; "Pig Farm Infrastructure Improvement project"
The big project that building piggeries - improving pig farm infrastructure in the communities of Batibo and Bawock had been carried out. 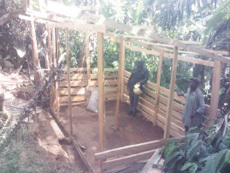 By powerful cooperation and support of many people, we were able to build the better quality pig houses to breed pigs healthy and efficiently. The final field report in 2015 "Pig Farm Infrastructure Improvement project"
The inaugral ceremony and testing the efficiency of the replaced oil press took place in Widukum. 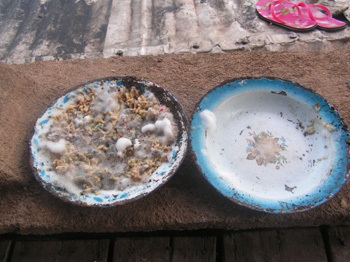 The group of NOWEPIFAC in Dinku village "Lovely Sister Bifang" were inaugurating and testing the efficiency of their replaced oil press. This report telling supporters that at last they are back on their feet with the oil press which is now functioning and serving their members and other villagers as well. 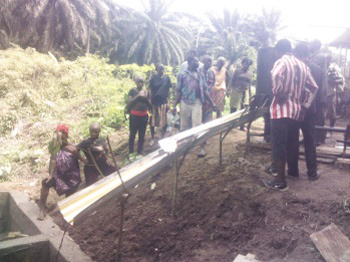 Latest News on the 2015 "Inauguration and Test of the Replaced Oil Press"
The special pig farming training was organized in Batibo sub-division. 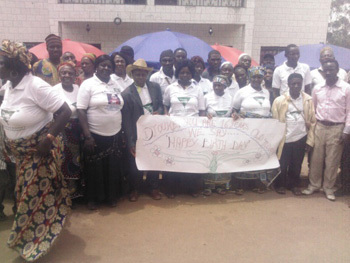 The special training with emphasising on bio-security was organized at Mbunjei cultural hall of Batibo sub-division. This training was not only organized for animal disease victims but also for every pig farmer who thinks that improving/updating one's knowledge is the key to success in pig farming. The iron windows donation for the slaughter house. four iron windows and an iron door were donated by the cooperative members and Japan, and these were fitted for our slaughter house. The slaughter house has been donated by our Dutch partner. so at same day, we also had an opportunity of celebrating that this slaughter house was built by these 3 nations collaboration, and hoping this friendship will continue years ahead. 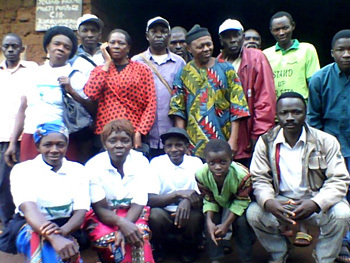 The evaluation team whom was made up of the project committee that were voted on the 21st February 2015 visited the 12 groups of our cooperative. This visits were intended to make the evaluation report for our Dutch partners and others with finding on the situation of the active groups of NOWPIFAC and that of some past sponsored projects as well as on-going projects. The evaluation visits were the first opportunities for us, and these visits were good for getting and confirming the facts on the actual situation on the field. A New Field Report has been posted. 2015 ACTIVITY AND FINANCIALREPORT of "A Pig Van Djouke Project"